As owner Bob Gottfred leads a tour of the basement at Erie-LaSalle Body Shop, he reveals a wall that survived the Great Chicago Fire. You can still see some black charring on the basement ceiling beams. "You k now, the basement used to be the first floor. When they rebuilt after the fire, the city was one level higher." It's just one more reminder that in Chicago, a business celebrating its 75th anniversary is as meaningful as it is rare. Erie-LaSalle Body Shop (146 W. Erie, Chicago, IL; 312-337-3903) is a Chicago institution for many reasons. Originally a blacksmith shop, it was transformed into a car repair shop by Gottfred's stepfather, Ivan Goodmonson, in 1934. In 1976, when Goodmonson retired, he asked his stepson to take over the business. With a degree in finance from Arizona State University and a background in the restaurant industry, Gottfred took over and has run the body shop with an executive's eye. Over the past several years his two grown sons, Jim and Jay, have joined him in running the business and their responsibilities have increased as they've gained experience. As it has done for 75 years, Erie-LaSalle continues to offer top-quality service to customers from all over the Chicago metro area. The shop boasts a team of 25 professional technicians, many of whom have been on board for decades-a testament to their skill and experience as much as to the profoundly decent way Gottfred treats them. They're a team that has succeeded for so long because they've mastered the fundamentals of good business: they're honest, prompt, courteous and deliver a high quality of service. Gottfred describes their mission: "We take a negative event-a car collision-and give our customers a pleasant, straightforward experience that minimizes the disruption in their lives. 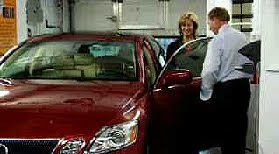 We pick up the damaged car and arrange for a car rental. We repair the car, constantly keeping our customer updated as to the status. Finally, we deliver the car to the customer when it's ready. It can't get any easier than that." A tour of the body shop also reveals how professional and intricate collision repair has become. Erie-LaSalle employees are clearly a team of professionals trained to use complex equipment and technology. They must know, in detail, how a wide range of cars are manufactured so they can repair them to factory specifications. "There are changes every day in this business," says Jay Gottfred. "Vehicles get more complicated; technology is added; new metals are substituted; different paints are used. Our profession is as much a science as it is an art." It has also become a complex business involving many people-customers, insurance companies, parts suppliers. Insurance companies are a major source of referral business. "Since we want to be part of their network, we must adhere to their pricing guidelines. We also work very hard to maintain our excellent professional reputation. Great service, promptness and competitive pricing are important keys to our success." Most car owners don't pay much attention to what goes on behind the scenes in collision repair, so they don't necessarily understand how much attention Erie-LaSalle pays to professionalism and efficiency. "Technical training is a must if we are to repair cars quickly and correctly," says Jim Gottfred. "Speed is crucial. We have customers who operate their business from their car and so we must get them up and running as soon as possible." For Erie-LaSalle, training is a way of life. The shop regularly hosts evening classes offered by two of the pre-eminent automotive training organizations: I-CAR (the Inter-Industry Conference on Auto Collision Repair) and ASA (the Automotive Service Association). The classes are led by certified instructors and are attended by both Erie-LaSalle technicians and professionals from other collision repair shops and insurance companies. "Hosting the classes reinforces our commitment to having a highly skilled team and an efficiently-run business," says Bob Gottfred. "It's not only a good way to network, but it's a convenient way for our professionals to stay current in their knowledge and skills." Our customers are really the beneficiaries of our training." I-CAR was founded in 1979 and provides an ever-changing curriculum for collision repair professionals. Erie-LaSalle has earned the I-CAR Gold Class Professional designation, the highest accreditation for a collision repair shop. The entire Erie-LaSalle team of repair professionals has earned the Platinum Individual designation, the highest level for individuals. With a company history spanning 75 years, there are just too many stories and memories to pick a single most memorable one. Gottfred likes to talk about a recent project to totally re-paint a Land Rover SUV. "It was quite an interesting test of our abilities. An owner of a new Land Rover contacted us to see if we would totally repaint the black SUV, transforming the color to a one-of a kind matte satin black. We agreed to take on the challenge and soon we were drop-shipped a crate of aftermarket parts from England." Erie-LaSalle installed side rocker pieces, a wing in back and new bumpers. They ordered and applied a special paint, working closely with DuPont. "The project was fun and turned out amazing," says Gottfred. "When we were done, we parked the Land Rover in front of Martini Park (a lounge across the street). The people went wild." Erie-LaSalle has seen more than a few cars of the rich and famous come through its doors. Probably the first true celeb was Ralph Capone, Al's brother. The roster of big names goes on and on: former Today Show host Dave Garroway, Cubs luminary Ernie Banks, news anchor Ron Majors, former Bears quarterback Vince Evans and NBA star Antwon Walker. What are the most difficult cars to repair? Limousines, says Gottfred. "Parts are hard to come by and you have to use your imagination to construct stretch panels and door panels." The 75th anniversary is an exciting yet humbling milestone for Erie LaSalle. "We all feel very lucky and very fortunate. Personally, I pinch myself everyday. To live in wonderful River North, working with my sons and my longtime team members is like a dream come true." Gottfred's enthusiasm for his business is matched by his friendly demeanor and gift of gab. He has been keenly involved in the well-being of his community, as demonstrated by his years of service on the executive board of the River North Business Association. The future holds interesting possibilities. Erie-LaSalle is looking to expand if the right deal comes along. Jim and Jay are taking on greater responsibilities, and they recognize the opportunities and challenges in front of them. "It's a never ending process, looking for better ways to do things, becoming faster without diminishing the quality of our service," says Bob Gottfred. "It's a challenging, competitive business and we're glad to be among the survivors." But the word "survivor" would be an understatement-Erie-LaSalle is one of Chicago's great small-business success stories. It easily serves as a role model, showing aspiring entrepreneurs the right way to build a business and keep it thriving for years and years. To learn more about Erie-LaSalle Body Shop, please visit www.erielasalle.com.